Real Life:: The Peach’s Big Bed. Folks, the Peach has a big girl bed. Finally. We tried it earlier this year right after she turned two but she just wasn’t ready. After spinning like a top and waking up crying a few days in a row in her big girl bed, the child actually ASKED for her crib. But now, she’s ready. But I don’t know if I am! She’s just so little. But she’s not. She’s a big girl and big girls don’t sleep in cribs. They sleep in beds. But she still uses the little quilt I made her when I was pregnant. And she has all of her friends near her too. OK, I’m a little bit nervous about her rolling out of the bed, so we rolled up two towels and put them under the mattress cover. But I think I a bit more nervous about her getting up and demanding to come into Mama’s bed. Or maybe just maybe, I’m kinda hoping for it. To pull her into bed for a little extra snuggle. How did you deal with the whole big bed? How do you keep them in the beds all night long? my kids slept on a twin mattress (no bed) til they got used to being out of their crib. Its unconventional but it worked! I actually think that is genius! Jut put it on the floor so you don’t have to worry about them rolling out and you can get in there with them! Very clever! I just wish we had room! Our nursery has like four stupid doors that block everything. As soon as Zelda got into the big girl bed, she hopped out of it every night, when everyone was asleep, and crawled into our bed. The cat does that too. Hey, Z and Pink Floyd are no fools. You guys do have a king size mattress right? Did you know that you were going to do the family bed when you signed up for the whole motherhood thing? It will take about a week to 12 days of training. Bringing them back in bed. Then do the Super Nanny trick of sit in the room but pay no attention until they fall asleep. It works. Good luck! I like that sit in the room until they fall asleep bit. Hmmm… I may try that in a few weeks should Miss Peach make the trip to our bed! We have a crib that converted! I was SUPER nervous about it because Cooper is really active and I just KNEW he would get out of his bed. He took to it like a champ and STILL waits for us to come get him after he wakes up. It’s been since January! Have faith!! And yes…it’s really sad to see their “baby” stuff go….sigh. Hearing that Cooper still waits for you to get him in the morning gives me hope! Actually, that corn pudding gives me hope. Aw what a rite of passage for the peach!! I was nervous as well. You might want to consider rearranging her room a bit so the bed can be flush against the wall on one side. We did that for wolfie and it really helped. then you only have one “rolling outta bed” side to worry about! Maybe we can put it up against a bed. I just want to crawl in there with her. Drat! I wish we had room for a proper twin bed! How do you keep them out of your bed? Isn’t that the question of the decade? Or at least for me, this decade! We go through weeks of peace in the midnight hours and then days of interruption. Last night, the 4 year old joined us twice, sneaking in from the foot of the bed to settle in between us. I don’t blame her. But I could smell her pull-up, so each time she fell asleep, I jostled my husband to put her back to bed. If we had a King, I might let her stay. Not to self: jostling husband move. I’m SO going to use that because Eric doesn’t believe that I’m still asleep. FIE! Whitney, we need to schedule those drinks, lady! Her bed is so sweet! 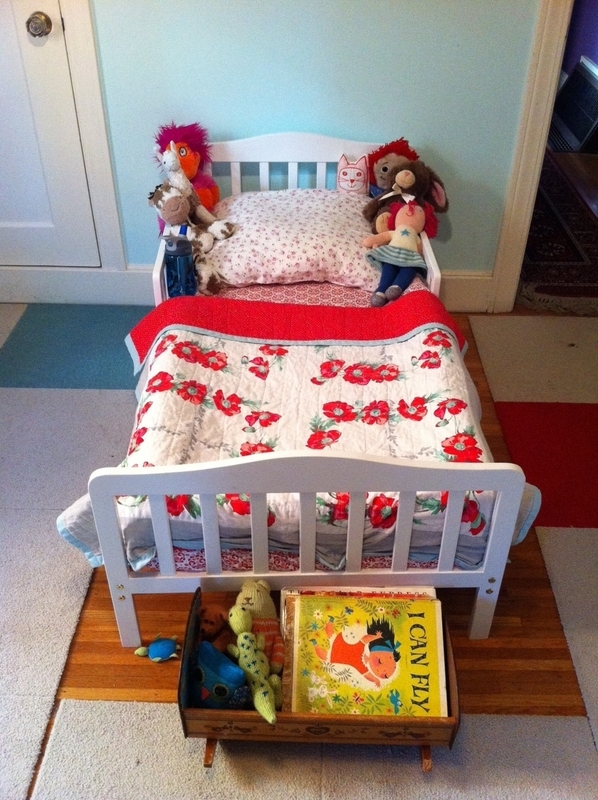 The preschooler’s cot was converted to its bed form months ago. Falling out is no problem (although we did transition with a rail for a few months, then took that off) but he still hops out on occasion. There are tears. Sometimes ours. A sticker chart has been involved. Also a fireman’s helmet prize for the ‘ultimate sleeper’. Sigh. Bron–I’m totally using that prize for the ultimate sleeper! Good call, lady! with little ones. Our children did pretty well except that found I needed to read a book right outside their door for quite awhile to keep them from wandering around and playing etc. Sort of being the guard outside the door! We moved Ingrid into a toddler bed when she was almost two. She never ever had a problem with it except at naptime. And that was b/c we took the Nuk away, not the crib. I consider myself super lucky!! We also put her bed up against a wall and she did fall out a couple times, but that’s why toddler beds are so short, they don’t have a long way to fall! Oh, it’s so crazy to think how fast they grow. That’s it! I’m moving the bed today! oliver was 2.75 years old when we switched him from sleeping half the night in his crib and half the night in our bed and i only did it then because i was four months pregnant and didn’t want him feeling kicked out of his crib. i was terrified and couldn’t imagine it going well and i guess some kind of miracle happened because he just acted like not a single thing had changed. we put him in my old full-sized bed. i lined the window sill (which just happens to be at the far edge of the bed and the exact right height for clubbing his head) with stuffed animals. we also put in a safety gate. for while, i insisted on laying gym mats along the side and end of the bed, but he has never fallen out (he’s 5.25 now). First off, Oliver is my all time favorite name for a boy. I love using stuffed animals as padding for kids! We totally do that too! Ha! We have the bed and her “crib” (read: Pack’n’Play) both in the room. The bed is a source of great fun, although since we moved her room around she actually asks to PLAY in the danged crib. So we’re still working on it. Go, Peach! We have a Christmas tree light timer connected to my girls’ lamp set for a certain time (6 am for my early birds). When their light comes on in the morning, they get to come out of bed and get a sticker/ prize for staying in bed. It helped them with night wakings because they knew that if their light wasn’t on, it wasn’t morning and time to get up yet. It is pretty effective, although we end up with a little warm body in bed every so often which I don’t mind too much. My big girl Daisy will snuggle with us, but my little toddler is a wiggler. 🙂 Good luck!